Another Italian band and I was warned when I read that a person with the name Fabio Lione performs the vocals on the track "A New Dimension". I thought that this would be the umpteenth Rhapsody-clone from Italy, but I was mistaken and mislead. O.K., the song with Fabio is very Rhapsody-like, just with less orchestral parts and a tad heavier, but the rest of the songs has a more Finnish power metal approach. After the intro, the first song sets off and the first Stratovarius albums enter my mind. With the songs to follow also the band Celesty and Angra has to be mentioned. Especially the first song has a rather happy character and even I get a smile on my face. Sometimes when the tempo goes up, they even lean close to melodic speed metal. Above that the songs have a rather progressive character and they are very catchy. If you like the early work of Dark Moor, you will find things to enjoy on this album for sure. Vocalist Andrea Bicego does at times sound a bit fragile ("Winter's Gone") and could have been more powerful, but on the other hand it suits the music and the atmosphere they want to create. The keyboard parts are in service of the songs and are unlike Rhapsody not orchestral. On the track "Everlasting" the female singing parts are done by the in Italy famous; Melody Castellari. She certainly can sing and it was a good idea to ask her. Finnish power metal with an Italian sauce, didn't know that would be possible. The album hasn't been given an overproduced sound and that is just what makes it a bit more authentic, reminding me of early 2000. 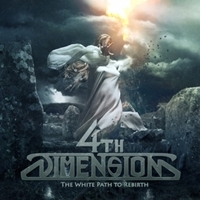 4th Dimension will not get the price for most original band of the year, but what they serve is good!